"Fleetwood Mac is gonna start rehearsing probably the beginning of February and I'm actually looking forward to it. I miss those guys." "Buckingham is also interested in recording with the band again, a project he says is on the "back burner" for now but not overruled. "Absolutely, absolutely I would," he says of creating a new album. "In fact, about six, seven months ago, John [McVie] and Mick [Fleetwood] were over here and we actually cut some tracks, and we did enough for maybe half an album. But you gotta get Stevie [Nicks] on board with that, and at the time, she was really quite caught up in what she was doing . . . but I would love to do that because John and Mick were playing their asses off." Come on Stevie... Get on board! This month, he concludes a solo acoustic tour and digitally releases a live album on November 13th. 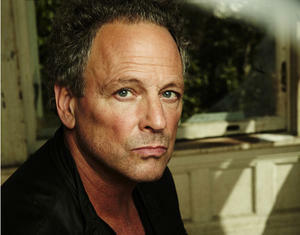 (Rolling Stone will premiere one cut, Fleetwood Mac's "Big Love," next week.) After that, he will return to the Fleetwood fold for the band's massive 2013 tour. Stevie deserves to be happy create new material with full creative control. The last few tours and the last Mac album were not fun for her. She most likely is doing this tour to get Mick off her back, but I think she is done recording full albums with the boys club. Let them do something on their own. Let her put out a solo record, a book, whatever as long as she is having fun. I completely disagree. I love Stevie and will be a fan forever, but there is some magic that happens when its Fleetwood Mac that exists on a whole other level. If the album doesn't happen, its our loss. Stevie's got to get over herself and answer the call of FLEETWOOD MAC. SAY YOU WILL was almost ten years ago and it's time to go back to them and infuse the band with new energy and purpose. Her music has more depth and discipline with them than it does in her solo work, as much as I love that too. I understand that she doesn't enjoy herself at all times working with the guys, but the same could be said about making music with them in their heyday. Maybe they could piece an album together while they're on the road and mix up the process a little so that she doesn't feel trapped. I'm confused with all these comments how Stevie can't deal with the guys in FM or doesn't know how to have good time with them anymore. Stevie is a strong woman - she can hold her own with the boys club and record with them. Considering she can't talk for 5 minutes without mentioning Lindsey she obviously still cares for these guys. At 64 I'm sure she has learned how to deal with people she knew most of her life. Stevie is doing the tour for Mick? Stevie is doing the tour for money. If she's truly over the Mac, she would be doing it for no other reason. Stevie does do it for the money, however Stevie is the draw card for the Mac, they know she brings in the big bucks. Stevie does it because she loves it and loves performing. Stevie recently said in an interview that if an opportunity to record a new Fleetwood Mac album came up, she would like to record a song which didn't make it on the Buckingham Nicks album. Also, Dave Stewart recently tweeted that he and Stevie were working on a new song. The relationships in Fleetwood Mac remain, as always, very complex. But yes Stevie should get on board and record with them. She should though, set a time limit and say let's get the recording done quickly and then get on the road. And please just a single album. The main problem with "Say You Will" was that it was too long and should have been edited down to 12 songs or so. Some of the material both of Stevie and Lindsey was not that great. Completely agree with the time limit! And they already have the timeline to work from - get the album together before going on the FM tour in March/April 2013. If half of the album with Lindsey's songs is already cut, they just need another half from Stevie, blend it together nicely, get rid of extra songs and put it out while on tour next year!! i LOVE STEVIE BUT THAT LAST COMMENT IS TO FUNNY! Fleetwood Mac should never tour with the Eagles. The Mac has their own audience, who are not mostly the same people as the Eagles fans are. The Mac don't need to tour with them anyway. Record some new stuff and as Stevie said "Get some ribbons and some bows and get back out on the road" ! ! ! I agree.. Stevie should get on board... as a band you band together and go with the majority. And to the person who said "Stevie is the draw card for the Mac, they know she brings in the big bucks......."
Whose gonna sing her songs? Those shifting lineups '90s experiments will never hold in 2012/13/14/15 etc. Lindsey IS Fleetwood Mac. Stevie LOOKS like Fleetwood Mac.